Usually, when we think of Bones Chapel we think of the one in Évora. However, there are more chapels of Bones in Portugal and the Évora one is not unique. 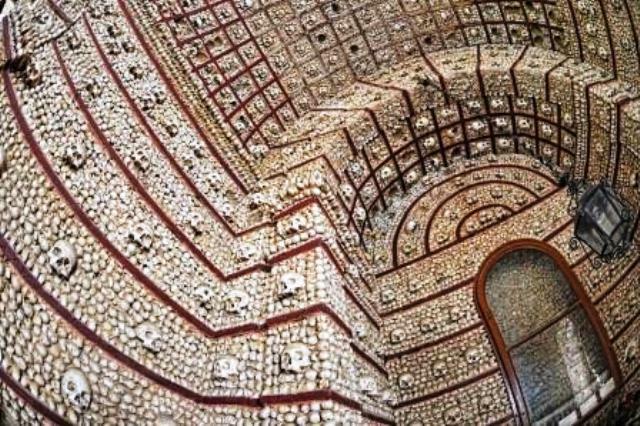 The Chapel of Bones Alcantarilha is located on the south side of the Parish Church of Our Lady of the Conception of the sixteenth century in the heart of the beautiful town of Alcantarilha in full Algarve region. The Chapel of Bones dating back also to the sixteenth century, set in the same stylistic line of other existing genre of chapels in the country, as in Évora, Faro and Lagos. Its interior is almost all covered and ornamented by more than 1,500 human bones, with the exception of work of sculpture of the figure of the Crucified Christ dating from the sixteenth century. Some say, though without any reliable evidence that these bones were of Jesuit brothers who perished in the region. Would you like to visit here? I’d love to visit there, and, of course, film. But I’d probably be thrown out. That is quite interesting. Of course I would like to visit. Beautiful photo. This is a bit creepy for me, Suzie. I don’t know if I would like to visit. How did it feel to you when you visited or did you not actually go? I haven’t actually seen it in person, no. I’d like to know the reason for it more than anything. Why? You know? I feel some research coming on. This tells some of the story, but I fear that it is quite as creepy as the photo. Must I look? Goosies …. fraid this tale just is gory to me. OK, I’ll peek. I think it is a cultural thing. I can’t say I would want to live in one, but I am interested in different cultures. That wasn’t too bad. But still the idea of all those bones … chills me to the bone. No pun intended. GRIN! Well, given a choice of having them scattered around and having them lovingly placed in a chapel it makes sense in a way. I must say it’s rather beautiful in a macabre kind of way. I wondered if it was to clear old cemeteries, as your link confirms – I read a book (I wonder how many times a day I start a sentence with those words? 😀 ) Anyway, I read a book, Andrew Miller’s ‘Pure’ about the clearing of the cemetery of les Innocents in Paris, the bones of which are used in the Paris catacombs – something I’d love to see one day. I thought it was an interesting concept. I’d like to see them next time we go to Portugal. I’ll probably have to go alone since I fairly certain that Harry would think it strange. It is, rather. Gives me lots to think about. WOW! That’s crazy! I’ve never heard of such a thing, but how cool! It is cool. Not something that would come to my mind, but hey, who knows? That is wonderful. Thank you for sharing it with us. Such a beautiful picture! But when I read more info about it, I said “Oooooh!” out loud. ( I’m sitting here in Taco Bell.) No, I wouldn’t like to visit, but I did like the picture.